Yesterday we headed to Perth to take part in the SCLD ‘Building Bridges: from Policy to Practice’ event. The purpose of the day was to talk about asset based approaches, including discussing recent research, showcasing some examples and talking about what happens next to make it the norm rather than the exception. Our video above features John telling us how the presentation went – thanks for coming to speak with us John! 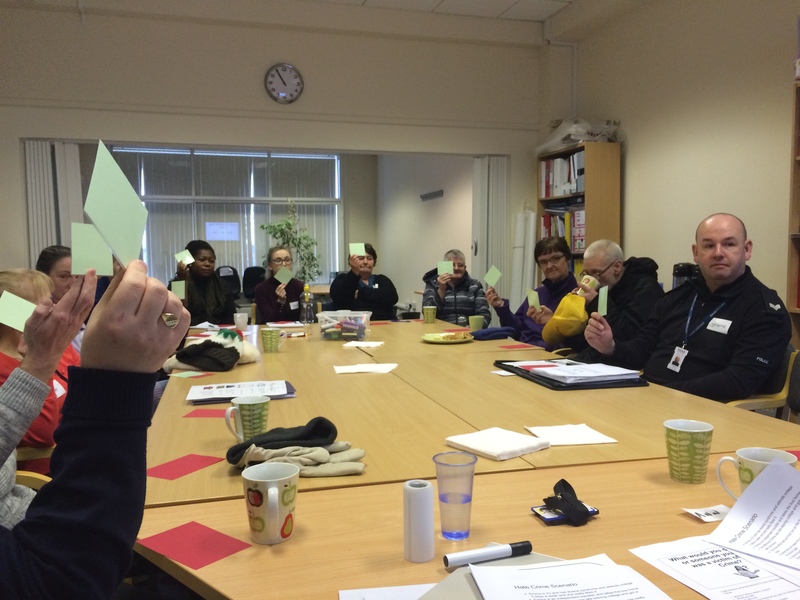 One of the reasons Support to Report worked so well was the assets that everyone brought to the group. Group members were able to explain hate crime and the importance of reporting it in a way that we never could. The value of their engagement with services in their communities went above and beyond raising the profile of disability hate crime and the impact on the group members in terms of confidence and self esteem was significant. Focusing on what people can do and what they bring to the table rather than what holds them back seems like such a simple thing and it is the approach lots of us have based our service model on for years. Jargon may change but the principles are not new. Now we just need to get the systems to fit the aspirations and potential of the people who use them. 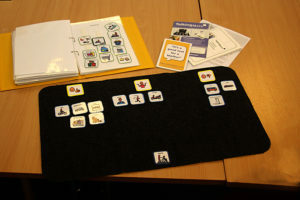 Earlier this year, we were really pleased to meet our target to train all our advocacy workers in Talking Mats. This was a big achievement for us – training involves 2 full days (with homework!) so it has taken a fair bit of commitment from the organisation and the staff members to get us to this point. So why’s that so important to us? Well one of the key principles underpinning everything we do is that people should be involved in decisions that affect them. All decisions, no matter how big (where they live, how they spend their money) or how small (what tv they watch, what they have for their breakfast). It’s the job of an advocate to help people share their views as much as they can. But it’s not always that simple for people to say how they feel – there are so many things that can put a barrier in the way for people, including disability or health conditions that impact on a person’s capacity to communicate. Talking Mats is one method to try to navigate around some of these barriers. It’s a really simple but effective tool for a person to communicate how they feel about particular subjects – from straightforward topics like activities they enjoy to more complicated topics like disclosing harm. Communication that supports people to share their views and supports them to be involved in decisions that affect them. And that’s why it fits so well with advocacy. Congratulations to our latest Talking Mats trainees who completed their Talking Mats (TM) and Talking Mats Keeping Safe (KS) training in May/June of this year. The Advocacy Project has now achieved its goal of ensuring all of its current front line staff are Talking Mats trained. 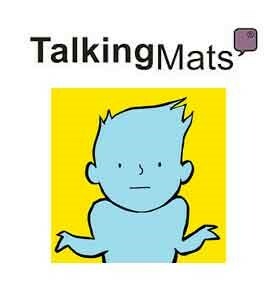 We now have 36 staff trained in the use of Talking Mats and the Talking Mats Keeping Safe Resource, enhancing communication for our service users and supporting them to be involved in decisions about their lives. Well done! Click below for more info on TM & KS. From 12th – 18th June is Carers week which is an annual campaign to raise awareness of carers and the challenges they face. It aims to draw attention to the importance of carers to the lives of people across the country and also recognise the contribution that they make to families and communities. This year, the campaign is focussing on Building Carer Friendly Communities, allowing carers to be supported in looking after their loved ones, while recognising that they are also individuals with needs of their own. 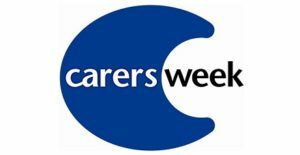 There is a range of events happening up and down the country this week – for more information or to get involved, please go to http://www.carersweek.org/. One in four people with a disability were victims of hate crime last year yet it is still massively under-reported to the police. We have created this short film to show how disability hate crime affects people in their daily life and to encourage people to act if they are victims of, or witness acts of hate crime. We want this film to be used to promote the message that disability hate crime should be reported. Please share this film and use as appropriate. If you wish to report a hate crime you can contact Police Scotland on 101, get in touch with a Third Party Reporting Centre or follow the link to https://www.scotland.police.uk/secureforms/hate-crime/. In late 2015, The Advocacy Project was awarded money from the Scottish Government’s Keys To Life Development Fund to help people with learning disabilities access Third Party Reporting Centres to report hate crime. They held some focus groups to find out what we knew about hate crime & third party reporting. They also asked for volunteers to get involved in spreading the word. They all said ‘yes’ and became the ‘Support to Report’ group. They got together and talked some more about what would be important to them if they were going to report a hate crime. They developed a presentation and a charter that would help third party reporting centres to give the right help to people. They also did some training on how to stand up and talk in front of big groups and then they were ready to go! They delivered their presentation to 23 Third Party Reporting Centres. They told us that it was very useful for them to think about how accessible they were in helping people with a learning disability, and what they were meant to do as a Third Party Reporting Centre. 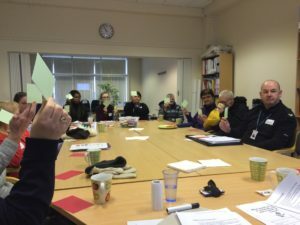 With more time and resources invested in our project, we used what we had learnt and decided to make some new presentations for people with learning disabilities and organisations that help them, to explain how they could report hate crime directly. We have delivered this to nearly 20 organisations and service users. 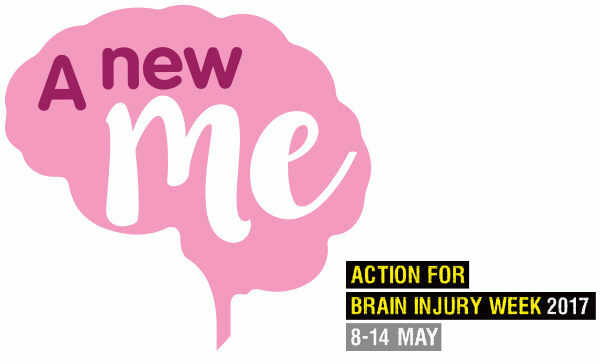 We wanted to complete the project with something that would making a lasting impact and could be used by anyone to help discuss disability hate crime. With the help of Urban Croft Films, we created this short film using our own experiences and thoughts. We hope that the film can be used to encourage people to report hate crime and think about its’ impact on peoples lives. If you would like to get in touch about the film or our other work, please contact the Engagement & Involvement team on 0141 420 0961. 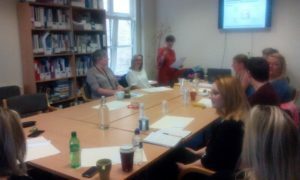 The Engagement & Involvement team are proud to have supported the Support to Report group on their journey. Over the last 15 months we have co-produced this resource with the group by facilitating discussion, developing the materials and supporting the group to deliver presentations. We believe that the impact and success of this work is entirely down to the involvement of the group members at every level. If you would like to find out more about the work of the Engagement & Involvement team, please check out our page here. One in four disabled people were victims of hate crime last year, yet it is still massively under reported to the police. 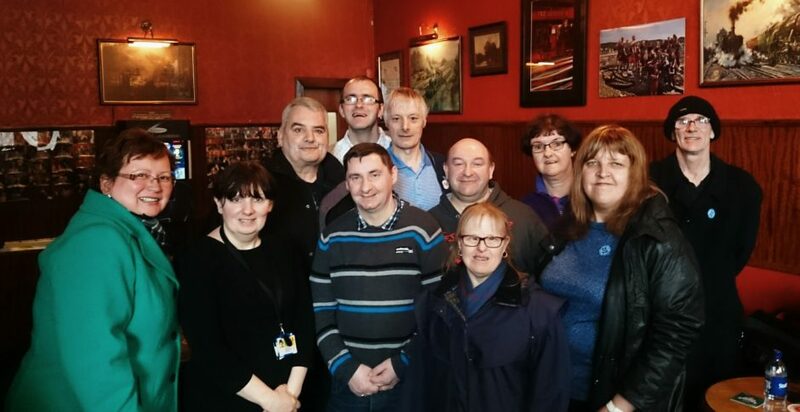 A group of people with learning disabilities, from across the West of Scotland have come together to encourage people to report disability hate crime. 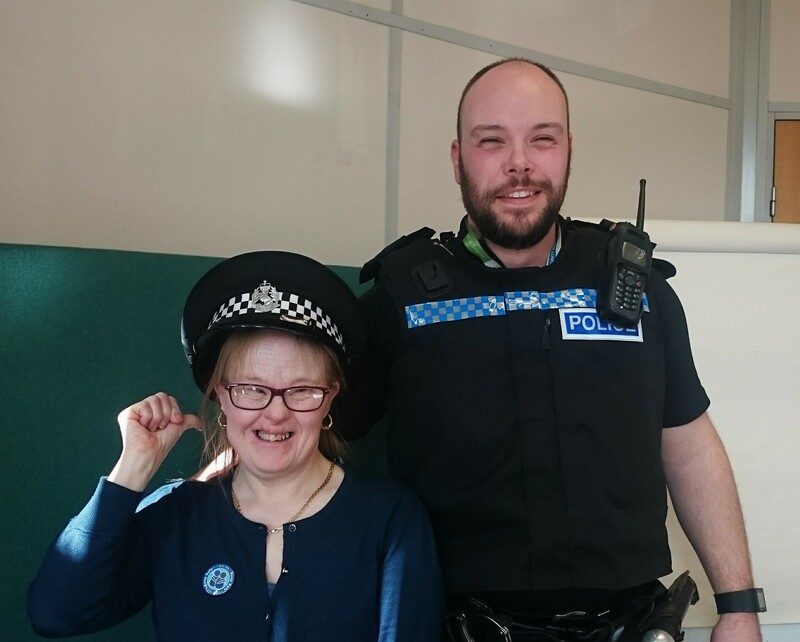 They have been working with The Advocacy Project and Police Scotland to raise awareness of disability hate crime and Third Party Reporting. Over the past year, the group have been delivering workshops they devised themselves to raise awareness of disability hate crime, the support people with learning disability may need to report an incident and the different ways it can be reported. The group have made a short film which looks at these issues. Now they want to use this film to spread the word further. Contact: Ann Lafferty 0141 420 0961 or ann@theadvocacyproject.org.uk for more information. 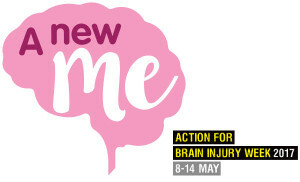 This year, May 8-14 is both Mental Health Awareness Week and Action For Brain Injury Week. Free Half Day Event: Professional Development & Learning Pathway – Independent Advocacy Scotland – 20th April 2017 @ The Advocacy Project, Cumbrae House, Glasgow – 11.00am – 2.30pm – Lunch & Refreshments Provided. Exclusive to SIAA Full & Affiliate 1 Members. The Advocacy Project is hosting an event themed around professional learning & development. This follows on from the SIAA national conference discussion in November where The Advocacy Project led a workshop discussing professional development for independent advocates and CPD for the advocacy sector. The workshop was extremely well attended for both sessions indicating a high level of interest amongst members, and we wish to offer your organisation the opportunity to meet up and progress that discussion. We wish to offer the opportunity to like-minded advocacy organisations to collaborate in taking this agenda forward. It would be beneficial if delegates attending this event have the authority to represent and speak for their organisation. • Teresa Dolan – Training Enterprise & Development – Continuous Professional Development for Independent Advocacy. • Scottish Credit & Qualifications Framework – What is Qualification Credit Rating & its benefits? • Gerry McGuire – L&D Manager @ The Advocacy Project – The Development & Roll Out of the Professional Practice Award in Advocacy Practice. Please note this event is for registered full SIAA & affiliate 1 member organisations only. Disabled Access Day events are taking place across the UK this weekend, on the 10th – 12th of March. These events are a great way to try something new for people with access needs. You can see what’s on in Glasgow, or search for events closer to you, here.